Don’t Forget: Nature Walk This Sunday at Mill Creek Marsh! The next Bergen County Audubon Society twice-monthly Meadowlands Nature Walk takes place this coming Sunday, Nov. 1, at the Mill Creek Marsh Trail in Secaucus, from 10 a.m. to noon. Expert BCAS guides will help identify birds and other wildlife. A spotting scope will be in use so everyone gets an up-close view of the sites on this free walk, which is open to all ages and experience levels. They’ll be focused especially on raptors, waterfowl and fall migrants. 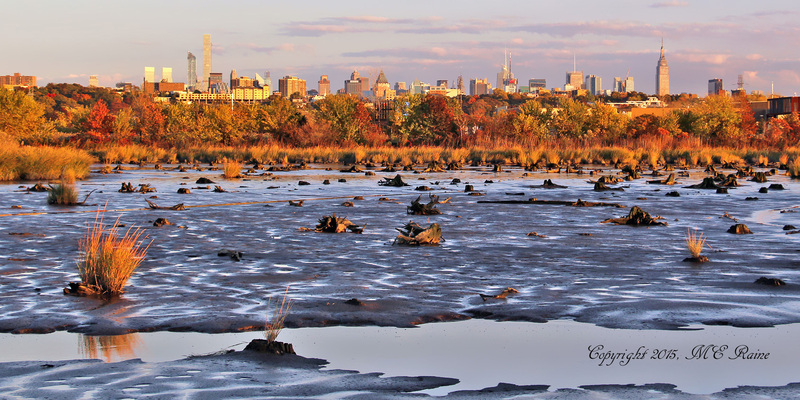 You’ll also have an opportunity to see the dozens of stumps of Atlantic White Cedars in the Marsh, the last vestiges of a primeval forest that once covered a third of the Meadowlands for hundreds of years. They are beautifully photographed above by Mickey Raine. The walk meets at the entrance to Mill Creek Marsh Trail, 3 Mill Creek Drive, Secaucus – park in Mill Creek Mall next to Bob’s Discount Furniture. Don’t forget to turn your clocks back an hour Saturday night!